In observation of Women’s History Month, each week of March the Dragonfly will feature a National Library of Medicine exhibit that highlights the history of women in health, science, and society. This week highlights domestic violence as a significant health issue through, “Confronting Violence: Improving Women’s Lives“. What is domestic violence? The National Domestic Violence Hotline defines it: “Domestic violence (also called intimate partner violence (IPV), domestic abuse or relationship abuse) is a pattern of behaviors used by one partner to maintain power and control over another partner in an intimate relationship.” Domestic violence affects individuals who are married, single, young and old. It does not discriminate according to religion, culture, race, sexual orientation, or gender. Nor do educational or socioeconomic levels matter. According to the National Coalition Against Domestic Violence, in the U.S. about 20 people per minute are physically abused by an intimate partner, domestic violence accounts for 15% of the total violent crimes, and over 20,000 phone calls are place on domestic violence hotlines each day. Victims experience a number of physical, mental and heath affects including high rates of depression and suicidal behavior and only 34% receiving medical care who are injured by intimate partners. Through the exhibit, Confronting Violence: Saving Women’s Lives, the National Library of Medicine highlights the role of nurses in identifying domestic violence as a significant health issue when other medical professions and society did not. Beginning in the late 1970s, nurses were in the forefront as they pushed the larger medical community to identify victims, adequately respond to their needs, and work towards the prevention of domestic violence. Through both their research and practice, nurses saw firsthand the epidemic of violence in women’s lives and were able to create and implement some of the first hospital protocols for treating women who were battered. By the 1990s, all the major medical organizations recognized domestic violence as a significant health issue. Yet, despite these changes the work of ending domestic violence still continues. As organizations and as individuals we must continue to work to support and empower victims of domestic violence and improve women’s lives. Information about this exhibit is also available through a recorded presentation at NLM when the exhibit first opened. 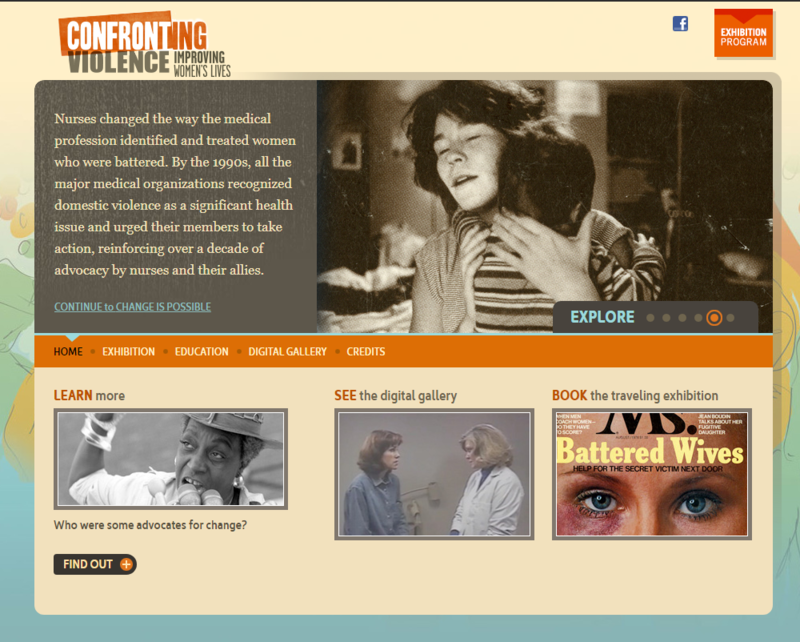 Confronting Violence is also a traveling exhibit which your library or organization may wish to host. Learn more about booking the exhibit on its Book an Exhibition web page. A 18 minute recording about program/activity ideas when hosting this exhibit is available to view. Want to visit the exhibit? It will be at Pullman Regional Hospital library in Pullman, WA February 3 – March 14, 2020.